This time of year is the NBA’s cloak-and-dagger season. It is, as far as I’m concerned, the very best time of year to be a fan. No winners; no losers. Just front-office executives, athletes, and agents lying their asses off and leaking false information. During cloak-and-dagger season, teams have to evaluate a number of different threats, very few of them obvious. Lottery teams have to identify which draft prospects have been targeted by other teams. They do this, obviously, to plan their own pick, but also to keep their eyes open for ambushes and opportunities for ambushes. If a team figures out which player another team picking later covets, then the opportunity arises to hold that player for ransom. In the 2014 draft, Sam Hinkie did just that. Using intel scraped from a mock draft in the pages of the Orlando Sentinel, Hinkie posited that the Magic planned on taking University of Louisiana–Lafayette point guard Elfrid Payton with the 12th pick. The Magic also owned a future first-rounder that at one point belonged to the Sixers and had been part of the the ill-fated deal for Andrew Bynum’s crippled lower extremities. Hinkie had been watching. With the 10th pick, he struck, selecting Payton out from under the Magic. He then turned around, put his finger in the front pocket of his hoodie to mimic a gun barrel, and extorted the no. 12 pick (Dario Saric, still kicking it live in Turkey), Phillie’s old first from the Bynum deal, and an additional second-round pick from Orlando. Lesson: Never trust Sam Hinkie. And I mean never. Like, if he trades you a guy, make sure the doctors he cites in the medical report actually exist. That kind of never trust. Then there are the free-agency-related deceptions and counter-deceptions. My personal favorite? The Alan Furst–meets–Harold Lloyd-hanging-from-the-clock-tower display performed by the Knicks and their GM at the time, Glen Grunwald, during the 2012 Las Vegas summer league. Back in July 2012, every multi-cell life form on planet Earth expected the Knicks to match all offers for their restricted free agent/shimmering comet of happiness Jeremy Lin. This was the man who had brought us that little thing called Linsanity, a period of concentrated madness during which New Yorkers believed in alien concepts like hope, magic, and wonder. And surely the Knicks would have matched any offer. Daryl Morey, though, is a keen player during cloak-and-dagger season. He crafted a wickedly structured offer sheet for Lin that featured a third-year balloon payment of nearly $15 million, calibrated carefully to muck up the Knicks’ salary cap. The Knicks were caught, pants down, and totally off guard. In their confusion, they were reduced to a state akin to that of mindless prey animal, fleeing dumbly across a meadow. Seeking to avoid the delivery of the Rockets’ offer sheet for Lin, Grunwald quite literally hid from the couriers carrying the documents. He hid! Perhaps no player is more emblematic of the craziness surrounding cloak-and-dagger season than LeBron James. The ramp-up to “The Decision” turned us all into amateur Kremlinologists. Last summer, tracking Dan Gilbert’s private jet became a minor pastime for degenerate NBA fans. And Grantland’s own Matt Borcas took us through the looking glass, tying together disparate wisps of information — including an order for cupcakes, the Instagram account for “LeBron’s personal DJ,” photos of moving trucks, and HTML code — to build a case that LeBron was returning to his wine-and-gold roots. So, in keeping with that tradition, let us enter the looking glass once again. 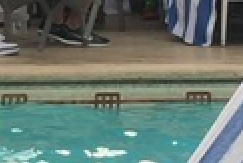 Background: Subject KING (K) and Subject LOVE (L), both players for the CLEVELAND CAVALIERS (CAVS) were sighted at a primary meeting near a pool. Topic of meeting: unknown. Exact location: unknown. On 24 Jun, Subject L opted out of the last year of his contract, becoming an unrestricted free agent. Additionally, assets within Subject K’s camp confirm that he also intends to opt on 1 Jul, raising the possibility (likelihood?) that discussions between the subjects were of a recruiting nature. Primary: Ascertain location of meet. Secondary: Ident ancillary subjects in attendance. If possible, determine nature of meet. Report: On Sunday, a picture, appearing on the Twitter feed of comedy writer Jensen Karp, sliced through quotidian weekend static on social media. It depicted LeBron James, in the company of several others, wearing a red tank top, at ease on what appears to be a chaise longue under a tented awning. 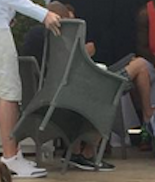 Kevin Love, wearing a white hoodie, snap-back, and beige shorts, is approaching James and his group from the viewer’s left, pulling up a woven-wicker outdoor chair. A cursory Internet search reveals numerous hotels with pools in the Los Angeles area. Despite a devastating drought crippling the region, reducing lawns and shrubbery in many areas to desiccated clumps of brown organic material, swimming pools remain in wide operation because rich people like to cool off and also pools don’t use that much water (they say). Mostly the first thing, though. Since the drought hadn’t affected any Los Angeles luxury-hotel pools, I had to base my investigation off the architectural and design details available in the picture itself. Using this method, I’m able to rule out hotels with irregularly shaped pools. Additionally, the walls of the swimming pool are inlaid with a distinctive tile design. Poolside furniture, chairs, and chaises are of a matching gray color, though the materials — possibly wicker or artificial wicker for the chairs and canvas for the chaises — appear to be different. The color of the furniture is somewhat camouflaged by the preponderance of blue-and-white-striped beach towels. Lastly, the metal struts supporting the legs of the tented awnings are arranged in a recognizable X pattern while the tents themselves are blue bordered with white. 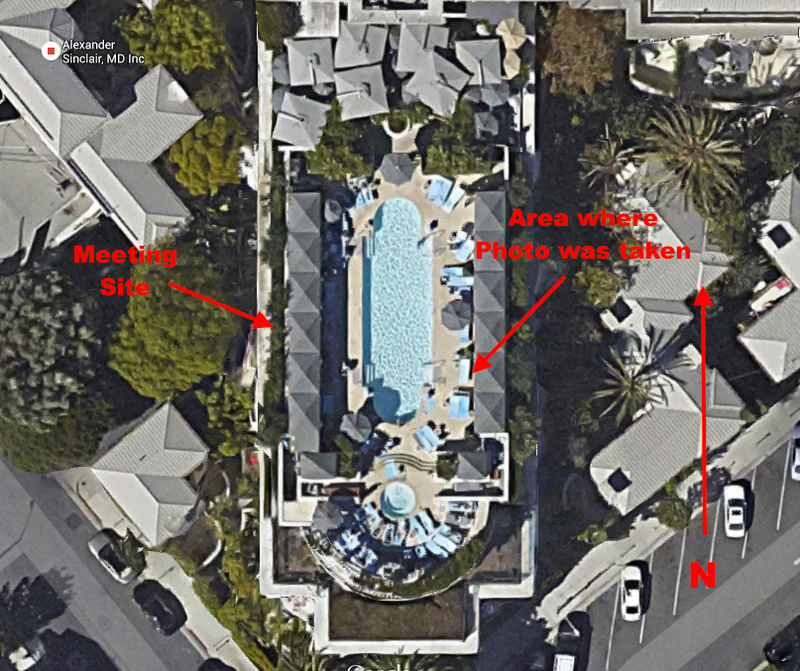 Fairly quickly after noting the above characteristics, I identify the likely hotel: The Peninsula Beverly Hills, located at 9882 South Santa Monica Boulevard in Beverly Hills.1 Analysis of satellite photography reveals that the oval ends of the pool are aligned north-south. Cross-referencing this information with the time of Jensen’s initial tweet (6:27 p.m. PT), we can, with a decent degree of accuracy, confirm on which side of the pool and in which bungalow James and Love were meeting. You’ll notice that by using a middle bungalow and keeping the units on either side vacant (which appears to be the case), James, Love, and their associates, are afforded a high level of privacy. Or, as high a level as possible these days what with Internet-connected cell phone cameras, the prevalence of social media, and easy access to accurate satellite photography. A deeper search of Twitter’s archives reveals that James has a history with the hotel. Screenwriter and Lakers fan Andrew Ungvari saw the King at the Peninsula Hotel in June 2008, and wrote an elongated tweet post about it. Sources close to James say his poolside chill-sesh was not a recruitment meeting. Stay woke and stay tuned.